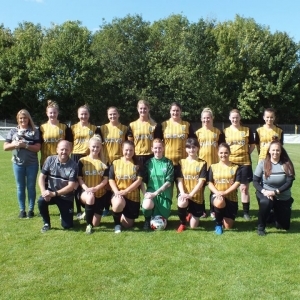 The First team ended 2018 sitting in 4th spot with the title already decided due to the league now operating with just 7 teams after Doncaster Belles withdrew due to a lack of players. For some reason the NERWFL were reluctant to add a third round of fixtures so 12 league games are all that were scheduled with Ossett Utd already securing the top spot. Our ladies started the year with just 5 league fixtures remaining (and a cup tie) and still a chance to finish league runners up if our girls could win all 5 games. First up was the home game against Harrogate Railway, the score finished 2-1 to the Owls with a penalty for Sophie Eyre and a goal for Jodie Stancill. The score line could have been much higher but a missed penalty and missed chances as well as a man of the match performance for the opposition Goal keeper kept the score down. It was another tremendous effort last Sunday against Wakefield away from home. With just 10 players available 1st team coach Michelle took up the position of goalkeeper with keeper Emily Darwin playing right wing to make it 11 to start. Events had transpired to leave us with just 1 regular midfielder available so players were shuffled and asked to play alternate roles. Over the 90 minutes Wakefield will have been disappointed to not have got something out of the game but a battling and determined performance and two goals for Jess Morrison meant the points came back to Sheffield.